Today's launch has been wonderful! I appreciate everyone who's been a part of creating this book, everyone who's bought a copy of The Zeiihbu Master (Ærenden #3) and those who've spread the word about the series. Your support is truly amazing! In celebration of today (and of you), I've made a batch of traditional Ærenden Toasting Drinks (or the closest I can approximate with Earth ingredients). 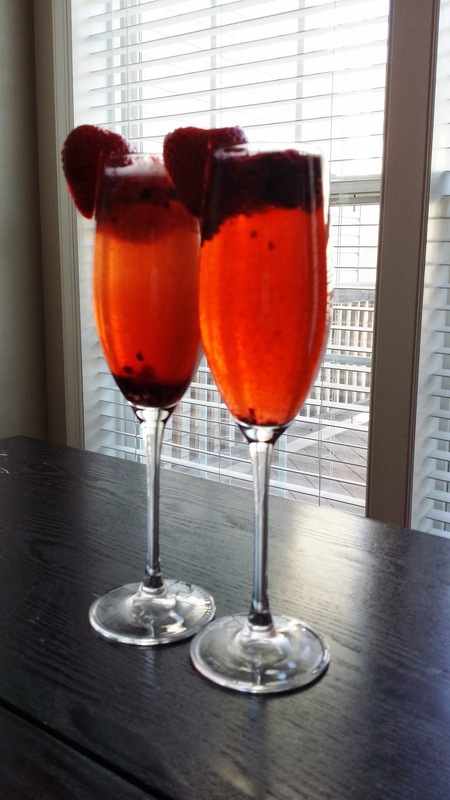 In the kingdom of Ærenden, the Toasting Drink is a sparkling wine made from slopeberries (clustered, burgundy colored berries that grow on the northeastern slopes of the kingdom's mountains; the slopeberry's sweet-tart flavor is best described as a dark, smokey strawberry). The wine is then blended with muddled slopeberries and served in goblets. Without further ado, a toast to YOU! Thank you all for being with me on this wonderful journey :). 1. Muddle the black currant juice, blackberries, and 1/2 of the strawberry together in a small bowl. Add mixture to a champagne flute. 2. Top with sparkling white grape juice (for those "of age", sparkling wine also works). 3. Rim with remaining 1/2 strawberry. 4. Raise your glass and toast. Enjoy!